I admit it: “Eat, Pray, Love” is not one of my favorite books. It’s not even in the top 1000. Actually, it annoyed me so much in parts that I skipped long sections of it. But I adore Elizabeth Gilbert and couldn’t wait to read a profile of her by Steve Almond, another one of my favorite writers, in this week’s New York Times Magazine. Many of you are probably wondering: How can you be an admirer of Elizabeth Gilbert and not a fan of “Eat, Pray, Love”? I mean, really, what else has she done? It’s simple: Elizabeth Gilbert is a writer’s writer. She is a master craftswoman. She is a daring, entertaining, and outrageously flexible writer. I loved Elizabeth’s essays. As a journalist, a biographer, short story writer, or an essayist, she could write vividly and movingly about anything from cowboys and pioneer life to Hank Williams III. (My personal favorite? Her piece about being a waitress at the Coyote Ugly bar that later inspired a movie…) I particularly loved one of her novels, Stern Men , about a young woman working and falling in love on lobster boats. So at the time in 2006 I was excited to read her memoir about searching for meaning, identity, and joy across the world. Like the rest of female America, a friend passed the book onto me. I had recently gone through my own period of sadness, loss, and confusion after a horrific breakup and the death of my father. I could relate to sitting and sobbing on the bathroom floor, devoid of hope and desperate for answers and meaning (for me, one of the most powerful scenes in the book). But we all get through losing our way in life and find a path toward resilience in different ways. I didn’t fault Elizabeth herself for the media creation of her as a self-help guru that was created over the next years. And I loved her follow-up to Eat, Pray, Love, Committed: A Love Story . I had recently married too (at age 35) and had been struggling with my own thoughts about independence, compatibility, and the daily negotiations of marriage. Yet even if you find no connection to Elizabeth’s writings about her journeys of self-discovery, as writers of all types (bloggers, journalists, scholars, fiction writers), we can find important lessons from Elizabeth’s career. After reading the New York Times profile, I realized how much there is to learn from Elizabeth herself. 1. Write like you have nothing to lose. Be bold, be unexpected, and challenge your readers and yourself. 2. Don’t confine yourself to one genre when you’re passionate about many. Elizabeth has written and spoken about her dislike for the term “chick-lit.” As a respected and award-winning journalist and literary novelist, she was baffled when she wrote about her own search for meaning and love but was suddenly relegated to the category of soft, light, and fluffy “women’s writing.” In her soon-to-be-published book The Signature of All Things: A Novel , she is going back to her literary fiction roots with a “serious” epic of historical fiction. Elizabeth refuses to be defined by literary categories or by readers’ and critics’ expectations of her work. 3. Don’t be afraid of being happy and content in your personal life. Strive for it in any way you can. Artists of all types make the mistake, according to Elizabeth, of believing that true creative genius only arises from suffering and misery. Gilbert believes that the balance and satisfaction that she found in her own personal life actually allows her to be a better writer. She does not romanticize the pain and sorrow that she has experienced and has no desire to return to it for the sake of art. 4. Find a community who loves you and respects you for who you are as a person and a writer. Gilbert surrounds herself with like-minded and loyal friends. She has long friendships and finds self-imposed seclusion to be harmful to her own creative processes. Her friends are her coaches, her critics, her family, and her greatest admirers. 5. Don’t use an “artistic tempermanent” as a crutch. Yes, writers and artists can be sensitive, passionate, imaginative, emotional, and turn inward. But passion and creativity will only get you so far. Hard work is the key to success on your own terms. You need to learn discipline and develop a strong work ethic. Art of all kinds is ultimately most about work — hard, difficult work. Her next book, coming out in October, is called “The Signature of All Things: A Novel .” It’s an epic story set in cities across the globe of the Whittaker family during the eighteenth and nineteenth centuries. First, there is Henry Whittaker, who becomes the richest man in Philadelphia from the South American quinine trade. The book’s heroine is his daughter, Alma, who becomes a botanist and researcher. It’s about evolution and the tension between reason, science, and the spiritual and divine, and it’s about love and passion. Do you plan on reading her new novel? 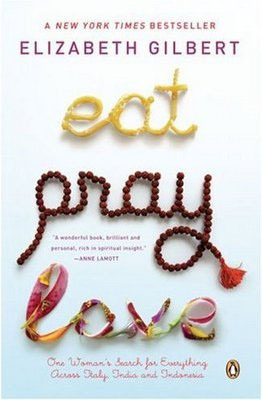 What did you think of Eat, Pray, Love? Are you a fan of Elizabeth Gilbert? The only part of Eat, Pray, Love that I liked was in the beginning when she was completely desolate– it had a ring of truth to it that seemed to disappear once she began her spiritual journey. Like you, I was very uncomfortable with the way she presented other cultures..maybe it’s our Wesleyan pinko liberal education, but it kind of offended me. I did like Stern Men, though, because you’re right: sister can WRITE. FIrst, I got married at 35 and at the time I felt like the oldest bride on the planet (thanks to a SOuthern upbringing). I love EG– I saw her speak a few years ago and she’s a powerhouse: articulate, passionate and humble. I liked E,P,L, but totally get the criticisms about that book. I’ll check out STern Men. I love the hard work reminder. It’s the only thing I can control anyway– I can’t control my temperament, as much as I would like to! I would love to hear her speak. She’s fascinating in interviews. Did you read Committed, her book after EPL? As an “older” bride, I loved how she wrote about marriage and her own journey on the road to “committing” herself to another person. Interesting. I wasn’t a Eat, Pray, Love fan either but I do like these lessons. I’m going to have to read her essays. Thanks for the insight! I was a fan of EPL and I’ve enjoyed her other work also because, as you said, she’s a damn good writer. Just left a long comment, I think I closed out of the window before hitting post. UGH. I don’t know her as a writer, but I really didn’t like the movie. It just seemed pretentious and not very smart. You’ve made me curious about her. I loved the writing/living tips you share. #3 especially hit home for me. I forgot to talk about the movie! First of all, Julia Roberts did not in any way seem convincing to me as Elizabeth Gilbert. To me, the movie just magnified all of the parts about the book that I did not like. There were parts that were filmed beautifully though. Spot on! I have the sense that #4 will be the key for me — I’m slowly trying to develop that community and know it will be invaluable as the years go on and I pursue different levels of the writing life. I haven’t read her stuff yet, (hides head in shame). I’ll admit when the movie came out and got bad reviews, I sort of sluffed her off. But maybe I should rethink her now that I’ve read your post! Julie DeNeen recently posted…Who’s Gonna Take Care of Me? Oh my gosh! I used the exact words in a comment to you elsewhere “boring and indulgent!” I never even finished the book. I probably won’t read her new novel actually but only because – again – I didn’t like EPL at all. But I love the life lessons you shared from her. If you like historical fiction at all, I would give her new book a try. She really is a phenomenal writer. As I said, I really didn’t like EPL either, but I’ve loved every other thing she’s written. Write like you have nothing to lose – I love that. I need to write that down and put it above my laptop. I was not a fan of Eat Pray Love but I will definitely give this new book a try. I didn’t know much about Gilbert beyond her one book – thanks for educating me! Sarah @ LeftBrainBuddha recently posted…What We DIDN’T Expect When We Were Expecting! From what I’ve read, it sounds like she did an astounding amount of historical research for this book. She was engrossed in journals from famous botanists and scientists of the time for ages. I should have included the TED talk in my post… It is fantastic! I completely agree that her “journey” started off as not terribly authentic since she got the book contract before she even went abroad! Anyway, I loved Almond’s very long feature on Gilbert. She deserves to be known for more than Eat, Pray, Love. I have also admired her work, and I’m looking forward to the novel that’s coming soon. From your list I especially loved #3. Wait– also #2. Okay– all of them! Nina recently posted…What If We Ended the Bar/Bat Mitzvah Tradition? I really loved this post. I didn’t realize how much I felt the same about her book until you voiced it. And you voiced exactly what bothered me too (love that quote about the brown sages). I haven’t read anything else by her, but this inspires me to give it a go – and to learn tips from her as a writer. This was such a great post Jessica. I felt exactly the same about Eat, Pray, Love. As much as I wanted to like it I just couldn’t. Despite that I still do love her and would read her again. It was enough to actually offend me. (also having lived as part of a new age cult and now having very close Indian friends) I found the whole concept trite. BUT I like the tenets of writing and that is somewhat redeeming. Hated EPL so much I didn’t make it through the first chapter. Self-indulgent blathering. But I like what you’ve garnered from her writing!